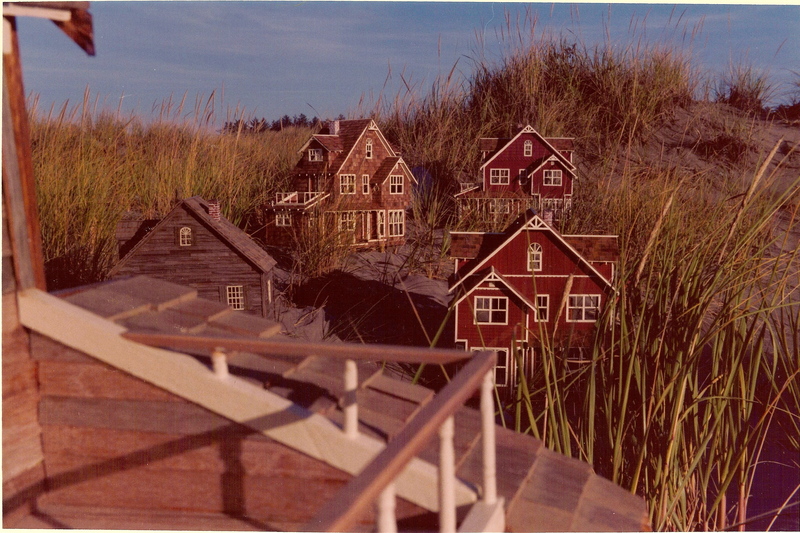 In 1974, while Noel was helping the local doctor build his dream boat, and I was counting bolts at the hardware store, we somehow managed to produce four dollhouses. We were working fools, eating clams we dug on the nearby beach and having fun. We had no idea what kind of a market there was for our houses, but thought of them as toys and wrote to Gump’s in San Francisco, and FAO Schwarz in New York, to see what would happen. Schwarz offered to take all four if we could get them to San Francisco. Two houses would stay there, and two would go to New York—we were ecstatic. The glitch was, they wanted 50% of the asking price—a big bite, but still, half of $1200.00 each was $600—our first dollhouse money. Plus there was the publicity, and who knows how many more orders. Shipping was out of the question, so we packed the houses into a U-Haul trailer, hooked it to the back bumper of the VW camper and towed them the 740 miles to San Francisco. We sang all the way, amazed at our dumb luck. Nearing the city the U-Haul started making serious noise due to the fact it had slowly been pulling the bumper off the back of the camper. At one point we stopped for Noel to try to tie the bumper back on, but it was a borderline repair. Due to more dumb luck, we made it, just, limping our way to FAO Schwarz’s downtown store intact. They were thrilled, and down the houses went, elevatored away, unceremoniously, through an opening in the sidewalk. Wow!, I thought, all that work just gone. Then we found out the houses were on consignment, and we would see no money until they sold. Ah well, we had our jobs, our health, and clams were free for the digging. That November, when we had yet to see a check from Schwarz, the San Francisco office called to say their president wanted to meet us. They wouldn’t say more, but it sounded promising. We couldn’t both afford to go, so we decided Noel would be our emissary. Somehow we dug up a round trip plane ticket for $59.00 (this was 1974), and off he went in his only remaining “good” clothes—a pair of Navy surplus wool sailor pants, and a cashmere turtleneck. It was 90 degrees in San Francisco. The president postponed the meeting until 4:00 p.m., and Noel literally sweated out the day on the streets. The president showed no interest in our houses, he merely wanted to tell us one thing–Plastic! Somewhere I think I still have that FAO Schwarz catalog with your house on the cover. I was so proud to know you both. Still am! This is fascinating. I remember coming to stay with you at the Seaview house when the miniature house business was booming, and seeing a work in progress and being amazed at the detail – as I recall you were shrink-copying old newspapers down to about an inch size and then treating them to turn them yellow, prior to sticking them in the attic as “insulation.” Looking forward to reading more! Right, the newspaper was a 1926 San Francisco paper that friends found in the bottom of their old couch. The local printer reduced it for us and printed it on some faded newsprint he couldn’t use for other jobs–perfect for us. That kind of insulation was used for a long time, including in the 200 yr. old farmhouse I grew up in (which you may remember) in Hingham, MA. I am so happy to see your blog and looking forward to seeing the photos from the past. I was trying to tell a friend about Pippen Hill but it can’t be described in words! Hi Pat and Noel. I smiled at the reference to the dollhouse in your friends pottery shop. It reminded me of the morning we were traveling down highway 1 coming from northern California. It was a Sunday morning about 7am. We had stopped for coffee at a small store on the side of the road. Next door there was, what looked to be a gift shop and thru the window I spied a dollhouse. I recognized the style right away, but there was no way to get close enough to know if it was actually one of yours, someone who had taken one of your classes, or a knock off. My husband asked me to get into the car, and I refused. I intended to stay in front of that shop until it opened. He groused at me for three hours while we waited, and when no one showed up, we asked the small store owner to call the person. He did………She wasn’t coming in, and she definitely wasn’t going to sell me that house. I begged, she said no. She didn’t have room for it at home, so kept it in the store for customers to look at. Yes, it was one of yours. I still dream about that house. In the meantime I still have the three pieces from classes I’ve taken with you and Noel over the years, and you will be pleased to know that all are finished inside and out. They are my treasures, and I wouldn’t part with mine either. I was delighted to read your blog. I am one of the extremely fortunate people who took two of your classes. You taught one of them at a miniature shop in Grandview, Missouri and one at the Kansas City Toy and Miniature Museum. I can proudly report that both are finished and furnished and are among my very favorite things. Every time that someone sees these two cottages, they are overwhelmed at how charming they are. Thank you for sharing your talents and for the joy you have created.